If you love green smoothies, it's important to have a reliable blender so that you can make them regularly. The good news is, we're here to help you find the perfect blender for your green smoothies, in a variety of price ranges. You'll be able to find the perfect tool for your home, and get good value for money. Just shop carefully and read these reviews to find the best blender for green smoothies. Though it has a higher price tag, this blender provides a lot of power to handle all your blending needs. The Breville BBL910XL blender is a fantastic option for those who want something heavy-duty and powerful. With a 2-hp motor, you'll be able to blend just about anything. Furthermore, it's able to hold up to 68 ounces of whatever you need. On top of that, the purchase comes with a 7-year warranty to protect your investment. It's also easy to operate and allows you to make a number of different things. Thanks to this blender's power, people find that just about anything they put into it comes out very smooth, including green smoothies. When you're finished, it's also easy to clean thanks to the dishwasher-safe design. It's hard to go wrong with this one! Since it's a heavy-duty device, this blender is also quite loud. You might find that you need to leave the room until the blending is finished. In some other cases, it can also stop turning on without any apparent cause, which can become somewhat frustrating. For those who want a quality blender at a decent price, the NutriBullet Pro is a fantastic choice. Spec 2: Holds 32 ounces. While it may not be as powerful as some other options, the NutriBullet Pro does have 900 watts of power, which is usually more than enough. It's also able to hold a decent amount of food or liquid, with 32 ounces of space. You'll also be protected by the warranty for one year. Because of the extra accessories, it's also very versatile. There isn't much you won't be able to do with this fantastic blender! One of the great things about this blender is that it's a lightweight, compact option, which means it's easier to take while you're traveling than some of the heavier options. At the same time, it's also a powerful choice that will give you few problems when it comes to blending. Some customers have found that odors can come from the motor, which is troubling for some users. In addition, there can sometimes be leakages that result in mess. Others also find that it can be a rather loud blender, so keep that in mind. If you're looking for something heavy-duty and powerful, this blender is worth a look. Though it is the most expensive option on this list, the Vitamix 7500 features a very powerful 2.2-hp motor that will be able to cut through just about anything. The pitcher can hold 64 ounces of whatever you're making so that you'll have plenty to share or save. Finally, the 7-year warranty means you will get plenty of use out of the device. For those who are concerned about style, it also comes in three different colors. One of the features customers really appreciate about this blender is that it runs more quietly than other options on the market. At the same time, it remains powerful so that you can get the work done you need without an issue. The largest problem reviews have mentioned is that black Teflon or plastic flakes can end up in the food you're blending. This is something worth keeping an eye out for if you decide to try out this device. In rare cases, there have also be issues with it not having enough power. If you want a great blender as well as add-ons at an affordable cost, this is the perfect choice. Spec 2: Holds 72 ounces. Compared to lots of other options, this blender offers more power, can hold greater amounts and still comes at a lower cost. It holds up to 72 ounces and provides 1,500 watts of power, more than enough to cut through most foods. You'll also get a 1-year warranty to help with any potential problems. There are also extra cups and containers for when you want smaller amounts, and a bowl for easy and convenient food processing. Many appreciate the value that this blender is able to offer. Thanks to the excellent design, versatility and decent price point, it's one you can use a lot without paying an over-the-top price. When you just want a single serving, you can also use the handy individual cups. Some customers can find that cleaning out this machine can be a bit more difficult than expected. There can also be some problems with the motor overheating, causing it to cease working. In other cases, there have been some issues with pitcher breakages. The KitchenAid blender is a fantastic option at an affordable cost, with a simple but powerful design. Spec 2: Holds 60 ounces. While it may not be as powerful as other options, this blender still has nearly 1 hp of power, which is more than enough for most foods you're going to put into it. You'll also have plenty to share thanks to the 60-ounce pitcher that is included with the purchase. On top of that, the warranty will protect your purchase for 5 years. For those who care about color, there are a vast multitude of color options that you can choose from. People who buy this blender generally find that it's a high-quality option that is designed to be efficient and durable without costing an arm and a leg. Most people have no problem using it on a daily basis for all their smoothie needs. It's important to keep in mind that this is a bigger, heavier device. Consequently, it may be harder to move around and clean than other options on the market. Some customers also find that it can overheat and cease working due to too much pressure being placed on the motor. In this list, the top blender choice for green smoothies is the Breville BBL910XL. It does have a higher price tag than some of the other options in this list, but buyers generally find that it's worth it due to its power and the great 7-year warranty that will ensure you get many years of use. 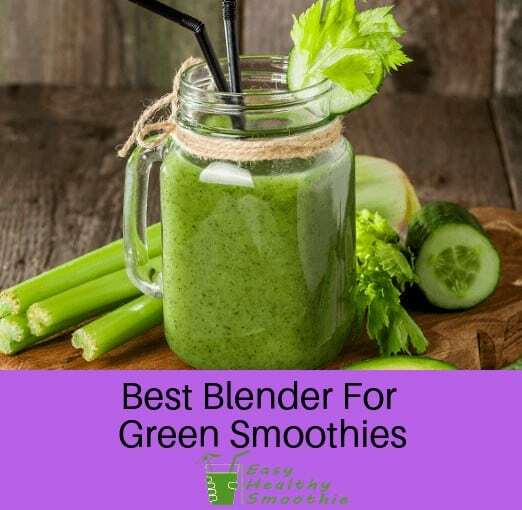 If you're looking for something a little different, make sure to compare the rest of the blenders in this list as well. There's no doubt you'll find the perfect one to suit your needs and budget.